July 8: Mobilize to Support the Prisoner Hunger Strikes! Unless the Governor and the Department of Corrections take decisive action, prisoners throughout California will resume a hunger strike and work stoppage ONE WEEK FROM TODAY to protest the torturous conditions in solitary confinement--and other parts of the prison system. Stand in Solidarity with the Hunger Strike and other Job Actions Being Called for July 8th! Sign up for updates [and find local actions, more info, background, prisoners' demands, resources, endorsers of the actions, etc] at prisonerhungerstrikesolidarity.wordpress.com. On this Day of Action, we're asking for people all over the world to do whatever they can to draw attention to the struggle of these prisoners against torturous conditions-- public rallies, banner drops, candlelight vigils, marches and other forms of public demonstration. **1. End Group Punishment & Administrative Abuse. Abolish the Debriefing Policy, and Modify Active/Inactive Gang Status Criteria. Comply with the US Commission on Safety and Abuse in America's Prisons 2006. Recommendations Regarding an End to Long-Term Solitary Confinement. We also hope that your actions will join the coalition and the strikers in demanding that the Governor and the CDCR enter into good-faith and accountable negotiations with the strikers immediately. Support the prisoners by advocating for the Five Core Demands rather than agitating for other goals or our own demands. Remember that the prisoners chose a "nonviolent peaceful protest" and plan your solidarity actions with that spirit in mind. Honor the strikers, their loved ones, supporters, and the larger community of prisoner-rights and anti-prison organizations by refusing to claim leadership of the solidarity campaign. Let us know what you have planned and we'll add it to our Action Calendar for all to see. And, if you are in California, please support the statewide mobilization to Corcoran State Prison on July, 13! Details below. 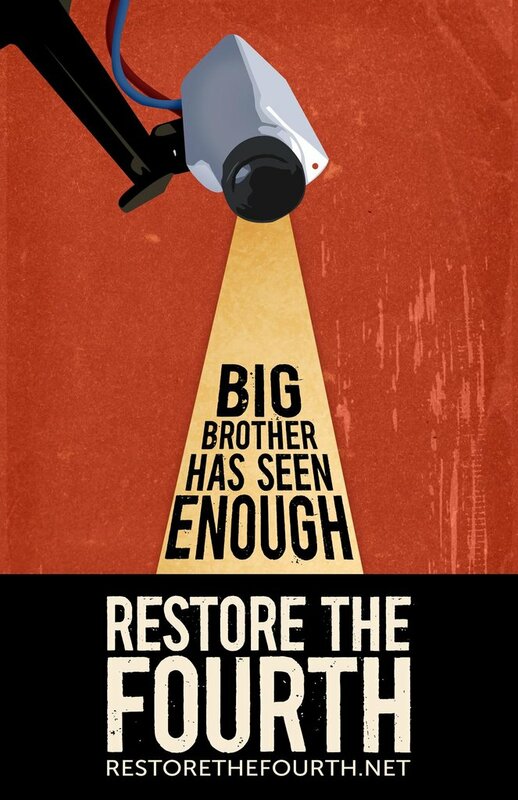 Restore the Fourth is a growing grassroots movement organizing nationwide pro-privacy rallies for July 4th, 2013. With July 4th just around the corner, we took the opportunity to interview Jett —a national organizer— to find out more about what's up with #restorethe4th. First, an open-ended question: what does Restore the Fourth mean to you personally? To me, Restore the Fourth is symbolic. The protests are taking place on July 4th, a date that commemorates the founding of a new country with new ideals free from oppression. Privacy rights aren’t only respected when the government feels like it, and they can’t simply be thrown away in the name of stopping crime. They’re universal, inherent to every person, American or not. Do you see Restore the Fourth as only about Edward Snowden and PRISM, or is it about broader issues of privacy and state surveillance? While Restore the Fourth as a movement was first created in light of Snowden and the NSA’s PRISM scandal, we were never intended to be specifically about that. We’re dedicated to focusing on overarching issues of privacy, both digitally and in the real world. People of color are unjustly targeted through programs such as "stop and frisk" and the extensive monitoring of Arab and Muslim communities. Are these issues for Restore the Fourth? Policies and tactics such as ‘stop and frisk’, that are employed by various police forces, are very much a concern for our organization. They’re arguably in violation of the 4th amendment of the United States, which protects from unreasonable searches and seizures. I believe that, moving forward, these may very well be issues at the forefront of our minds. What would you say to occupiers and other activists who have been victims of intense federal, police, and even corporate surveillance? Protect yourself. You may not be able to shake the surveillance, but you will be able to take steps in protecting yourself, your family and your private life from unnecessary surveillance. Secure your communications, strengthen your passwords, and check out http://prism-break.org/ for some privacy-secure alternatives to popular software. Restore the Fourth is an American-based movement, but the U.S. and other nations are engaged in widespread surveillance of non-Americans all over the world. How do you feel we should go about building global solidarity around privacy rights? As I’ve mentioned previously, I believe that there are a certain set of rights inherent to all humans on this planet - privacy and safety from surveillance being one of them. On a global level, it’s a bit more difficult to secure privacy rights, specifically because different jurisdictions have different laws and customs. Ideally, a network of support would be the best - people in China fighting for privacy rights with those in America supporting them, and vice versa. Anonymous, anarchists, occupiers, and others are also planning diverse actions for July 4th. How do you distinguish Restore the Fourth as a tactical approach? Do you expect Restore the Fourth rallies will be safe events for people looking to avoid police violence and arrest? Being non-partisan, Restore the Fourth doesn’t officially endorse any other groups, but we very much welcome their support. So far, we’ve worked very closely with occupiers, and their support has been tremendous. I fully expect the protests to be safe for people of any affiliation from arrest, so long as no acts of violence occur. In addition to turning out for Thursday’s rallies, what else can people do to show support and get involved? Are there any resources you'd like to share? It looks like we’ll see a good turnout Thursday, but what happens after July 4th? Are there further actions being planned? This movement started only a few weeks ago, and since then we've experienced exponential growth and progress. Since the movement is still very young, plans diverge in the long term on what we hope to achieve. Personally, I'd like to see a combination of legislative and litigative action (something like what the ACLU does), and others want to see further plans of action. With organizations such as the BORDC, stopwatching.us and the EFF behind us, I feel that we can achieve all of this and much more. Under the banner of a grassroots nonpartisan organization called Restore the Fourth, thousands will be gathering on the 4th of July in dozens of cities across the United States to demand an end to unconstitutional governmental surveillance programs that violate the 4th Amendment rights of Americans. In New York City, 4th Amendment rights issues go well beyond those recently revealed unconstitutional NSA spying programs. In addition to the national goal of seeking an end to these programs, we demand New York City stop all search and surveillance policies that target groups based on their race, religion, or political views. We demand an end to "Stop and Frisk," which targets people of color across the city, and an end to the discriminatory surveillance of Muslim Americans by the NYPD. The rally on the 4th of July will begin at noon around Union Square South. We will march to Federal Hall. Despite the fact a permit will not be filed for this march, it is the intention of Restore the Fourth that the march be nonviolent and lawful. Since we expect to have attendees from all backgrounds and age groups, we want this event be safe for everyone involved without the risk of police violence and arrest. In addition, we're holding organizational meeting on Wednesday, July 3rd, at 8:00pm in Washington Square Park by the Garibaldi statue on the East side of the park. We will discuss the direction of the movement in the weeks beyond the 4th of July as well as any last-minute details for the march. We hope to see you at our meeting, and if not, at our rally to Restore the Fourth!